Placenta previa means a low-lying placenta, which occurs when the placenta is either partially covering (partial or minor), or completely covering (complete or major), the cervix. 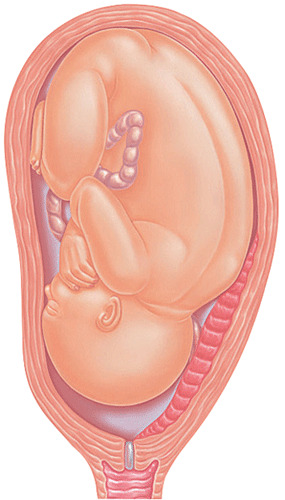 In complete placenta previa, the baby cannot be born vaginally. Complete placenta previa poses a high risk of heavy bleeding, either in the later stages of pregnancy or during the actual labor, which is treated as an emergency. If a low-lying placenta is detected at your 20-week ultrasound, you may be offered a scan in late pregnancy; this is because the placenta may “move up” as the uterus grows, and by about 34 weeks may no longer be low. If you have placenta previa, particularly complete placenta previa, most hospitals admit you for bed rest in the last days of pregnancy until the birth so that if you bleed heavily, you can be treated immediately. Only part of the placenta is covering the cervix, which means that a natural vaginal delivery may be possible. 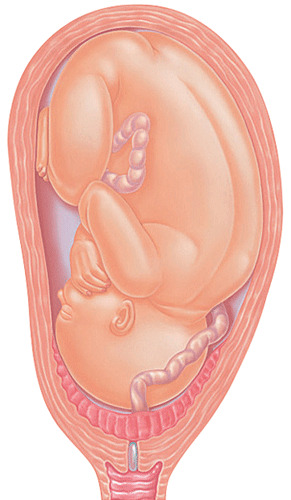 The placenta is directly above the cervix, which means the baby will need to be delivered by cesarean section. Preeclampsia is a condition that affects around 10 percent of women during their pregnancy (or, rarely, in the first 72 hours after the delivery). The cause is still unknown, although it is thought that it may be caused by a malfunction of the placenta. Q: What are the symptoms? A: There are varying degrees of preeclampsia, from your blood pressure rising a little bit toward the end of your pregnancy and a small amount of protein detected in your urine (which affects about 1 in 10 pregnant women), to a large rise in your blood pressure and a considerable amount of protein found in your urine (affecting about 1 in 50 pregnant women). Your blood pressure and urine will be checked (and the size of your baby measured) at your prenatal appointments to look for signs of preeclampsia and you will be referred to the hospital if necessary. Sudden swelling, headaches, pain under your ribs, and visual disturbances also indicate preeclampsia and you should contact your midwife or doctor right away if you experience any of these. A: If you have the milder form of preeclampsia, this will only require your blood pressure and urine being tested a little more frequently—perhaps weekly. However, the more serious form will require you to go to the hospital, where you and your baby will be monitored and given medication to lower your blood pressure. This is because if you are left untreated, it could develop into eclampsia, which is a very serious condition in which you may suffer convulsions, and your and your baby's lives could be in danger. Induction of labor is sometimes recommended if the condition seems to be worsening or if your blood pressure gets too high. Once your baby is born and the pregnancy is over, the preeclampsia goes away. Q: Who is at risk? A: Women are at a greater risk of preeclampsia if they have had the condition before; are over 40 years old; have a body mass index (BMI) over 35; have a family history of preeclampsia (mother or sister); had high blood pressure, diabetes, or kidney disease before the pregnancy; or are carrying more than one baby. 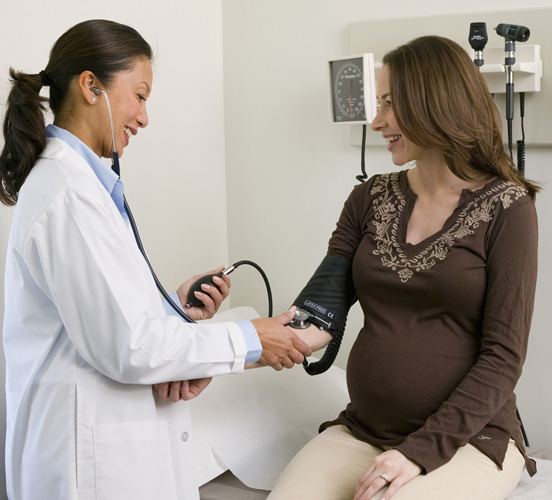 Regular monitoring of blood pressure at prenatal appointments helps to detect women at risk of preeclampsia. Q: All women love being pregnant? A: That pregnancy makes women completely happy is a myth. While being pregnant and starting a family can cause tremendous joy, it is also quite an exhausting and overwhelming experience, with major biological, psychological, and social changes to cope with. Everyone's pregnancy is different—you'll probably find that it's a great experience but can be difficult. Q: My vivid baby dreams are a bad sign? A: Pregnant women often have strange, vivid dreams, but this is completely normal. Experts attribute the vividness of these dreams to hormones, as well as all the emotional and physical changes you're going through. The vivid dreams may be a way for your subconscious to deal with all the hopes and fears you may have about pregnancy and impending motherhood. Q: Morning sickness will starve my baby? A: Morning sickness is one of the most common pregnancy symptoms, and is believed to be caused by pregnancy hormones. It's easy to panic if you're throwing up every morning and you don't seem to be gaining weight, but try not to worry—you won't really start to gain weight until later in your pregnancy. As long as you were healthy before you became pregnant, your baby will be more than adequately nourished. However, it is possible that severe pregnancy sickness (hyperemesis gravidarum) can compromise your baby, so tell your obstetrician or midwife if you aren't able to keep any liquids or foods down. - Can Yoga help with high blood pressure?